At the time of this writing, it is but a few days until my daughter returns home to celebrate her seventeenth birthday. This will be her first home visit since she left about nine months ago to begin residential treatment for the addiction to OxyContin she developed while experimenting with drugs in high school. I had no idea what OxyContin was until this nightmare hit. There’s a lot to learn when someone you love falls into addiction—about the substance involved, intervention, addiction, recovery, relapse, and how to care for that person as well as yourself and your family. With this home visit, we’re not only marking my daughter’s birthday, we’re also testing the waters to see how she, her father and I apply what we have been learning in family therapy. So how does one prepare for a loved one’s return home after residential treatment? How do we reengage in daily life together in ways that support one another's well-being? That’s been the current focus in my education on addiction and recovery. I’m certainly no expert. I’m a parent who loves a daughter who is committed to reclaiming a full life. Still, although the particulars at play in recovery vary for all families, it’s helpful for those of us in the same predicament to hear from one another, which is, in fact, the basis of the Twelve Step programs that are a key part of most recovery work. Sharing stories serves as a healthy reminder that there is common ground and there are resources out there to help us when residential treatment is over. Two of the early lessons I learned that will continue to be important throughout recovery are that addiction is a disease and it’s the family’s disease as much as it is the addict’s. To understand that addiction is a chronic, progressive and potentially fatal disease is to recognize that the addict is not morally weak and that the work of recovery is life-long. And to understand that the disease has a neurophysiological and a psycho-spiritual aspect is to acknowledge the importance of both these elements in its management and healing. “If we simply reduce addiction to the material parts of the brain, we miss something important about addiction and how to treat it,” writes Kevin McCauley and Cory Reich in their book Addiction. McCauley and Reich clearly explain how addiction reflects an unraveling of the brain’s ability to perceive pleasure, to remember it and to make choices about it. Along with insights into the dynamics of brain chemistry, the authors emphasize the meaning that drugs hold for addicts and how so many of the solutions that work on addiction are of a spiritual nature. “The only thing that will truly change the addict’s deep, emotional attachment to their drug and the personal meaning they give it is something deeper, more personal, more emotionally and more spiritually meaningful. The only way to compete with the meaning that drugs have for the addict is to validate that meaning and then help the addict find greater meaning from things in recovery,” they write. Educating ourselves about the nature of this disease also informs our attitude toward it. When family members understand that the problem loved ones face is a disease rather than a weakness of character, the long-standing stigma of addiction will not interfere with their response. The stigma is toxic and stands in the way of effectively dealing with this disease at all its levels. When we can come to clear terms with the fact that addiction is a disease that has affected everyone in the family, we can respond more effectively and more compassionately. Douglas Ziedonis, director of the University of Massachusetts’ Center of Excellence in Addictions, points out that most accept that in the early stages of recovery an addict’s brain is undergoing acute and prolonged detox. He says research is needed on changes occurring in the brains of those close to the patient. In short, everyone in the family is in need of healing and recovery and, ideally, participates in the recovery process. When family members participate in therapy and lend to their individual healing before the addict returns home, they are doing some of the most substantial and important preparation. They are identifying together and individually the behaviors and issues that enabled the addict’s disease to take hold within the family. This is not to say that the family caused the disease. Many addicts come from loving homes yet perceive they are unloved. Finding refuge in drugs is, of course, a symptom of some kind of ‘disease’ within the addict. Once sobriety has been stabilized and dysfunctional relationship patterns are identified, the work of changing these patterns begins. Behavioral changes are difficult to make, but the good news is that they are possible. My daughter’s educational consultant and the founder of Northlight Family Services in Westminster, Colo., Robert Meltzer, describes the neurodynamics of behavioral change as the Grand Canyon Effect. A growing body of research in neuroscience validates our capacity for change. So if we’re willing to do the work, there is every reason to be hopeful. This is especially evident in families of those who are struggling with addiction. 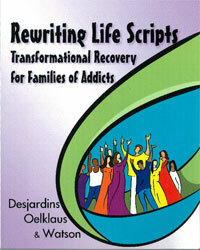 As an addict confronts his or her situation and begins to change, other family members are challenged to change as well. Every family member who commits to positive change increases the momentum. This is the transformational opportunity a family shares throughout recovery, and research confirms that family involvement makes a significant difference in recovery outcomes. 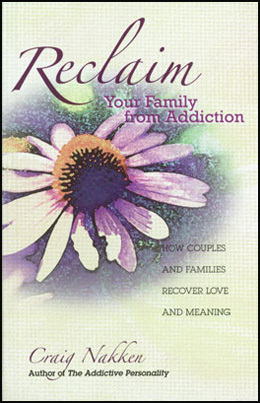 In his book Reclaim Your Family from Addiction, family therapist and addiction specialist Craig Nakken divides recovery into three stages: early, middle and late—noting that there are no clear beginnings and endings to these sometimes overlapping stages. The spiritual principles and values we need to cultivate in each stage are cumulative, and all come into play when our loved one returns home. In early recovery, when the family is reorienting itself away from addiction and toward health, honesty and tolerance are essential as family members begin to communicate hurts and truths hidden beneath the addictive system. Early recovery also asks family members to shift from other-examination to self-examination, as we come to realize that we cannot change anyone but ourselves—a wise life-long practice. “The primary spiritual task of families is to create and sustain love,” writes Nakken. “In late recovery, families return to this primary task.” Harmony, balance and love flourish within a family now able to make a reliably positive difference in the community. Everything I’ve read about families in recovery and all the families I’ve talked with who have traveled this road emphasize the importance of a support system for everyone in the family. Support might be found in any number of ways: reading, seeing a therapist, talking with clergy, communicating with other families or participating in a recovery support group. The most widely used, available and effective recovery support groups are based on the Twelve Steps. Although the addict can turn to Alcoholics Anonymous, Narcotics Anonymous and other substance-specific variations, family members can turn to Al-Anon, Families Anonymous, Alateen (for teens and older children) and Co-Dependents Anonymous. At Twelve Step meetings, both those who are addicted and their families are reminded of what they can and cannot control. As the Serenity Prayer says, “God grant me the serenity to accept the things I cannot change, the courage to change the things I can, and the wisdom to know the difference.” For all of us, it boils down to the inescapable fact that the only person we can change is ourselves. During these meetings, families of addicts also learn from participants and literature about codependent and enabling behaviors that defeat healthy growth for both the addict and the enabler. There’s also the opportunity to work with a sponsor in a Twelve Step program. A sponsor is someone who’s been with the program long enough and come far enough to knowingly guide another through his or her work. Fear of relapse inevitably haunts my family. When my daughter first left for treatment and I began reading addiction literature, I kept running into the reminder: “Relapse is a part of recovery.” It frightened me every time I thought about it, and it still can, if I let myself dwell on it. But that fear is lessening as her recovery and mine have developed. She has learned so much about herself in treatment, and she has gained skills she didn’t have. The same is true for her father and me. The National Institute on Alcohol Abuse and Alcoholism found that roughly one-third of those in recovery remain sober. Although the statistics are daunting, there are steps we can take to minimize the chance of relapse. We can begin by asking our loved one what he needs to prevent relapse. In family therapy, everyone can help to build a relapse prevention plan that includes the addict identifying behaviors, people, places and situations that make him vulnerable. We can make our homes a sober environment, and for those returning to their families but not their family homes, we can help them to find sober housing. We can support a return to a structured daily routine of health-promoting activities such as school and work, attendance at meetings, securing a sponsor, building a support system of sober friends and physical exercise. We can drug test. We can plan what steps we’ll take to intervene if relapse occurs. Sometimes when I think about the life-long sentence of recovery work, I feel overwhelmed. But when I think about recovery as an invitation to consciously create a life of meaning, I begin to feel oddly blessed that what started as a nightmare might actually be the turning point to richer lives than we might have otherwise known. Unexpected gifts are also a part of this journey. I’ve learned that my daughter, her father and I all have the capacity to heal and to love. That has transformed our once-broken family into a committed nucleus of honorable individuals, intent on sustaining forgiveness, peace and gratitude.